I am often asked this question. 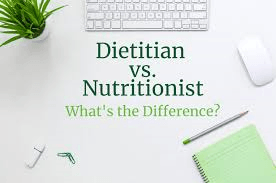 The main differences between a dietitian and a nutritionist involve schooling, certification, and registration requirements. Dietitians can be called nutritionists, but nutritionists can only be called dietitians if they have the proper education and training. Dietitians are required to graduate from college with a Bachelor’s degree, and most are mandated to earn a Master’s degree as well. In addition, a dietitian has to apply and be accepted to an accredited (by the Commission of Dietetics, CDR) internship program. After completing this program (which usually lasts about ten months) the CDR dietitian exam must be taken and passed in order to be considered, and practice as, a registered dietitian (RD). A dietitian has to maintain this registration status every five years by completing a minimum of 75 continuing education credits (that are approved by the CDR). Dietitians can also enter various fields and take other exams to have additional credentials in order to work with diabetes or renal patients. Nutritionists do not need any specific training or education in order to call themselves nutritionists. They are not allowed to call themselves dietitians unless they pass the above stated requirements. Many people in various fields call themselves nutritionists merely by obtaining knowledge online, in books, or by simply having an interest in nutrition. This can lead to people providing nutritional information without the proper education and with lack of access to research-based information. Education doesn’t mean that all dietitians know everything and nutritionists know nothing. It means that when a patient is referred to a dietitian, that individual benefits from a professional who has undergone many hours of schooling, has worked in various nutrition settings, and is able to provide tailored medical nutrition information. Go online to the Academy of Nutrition and Dietetics in order to learn more, find excellent resources, and search for a registered dietitian in your area.